A new weekly newspaper praised its main competitor as it hit the streets for the first time this week. 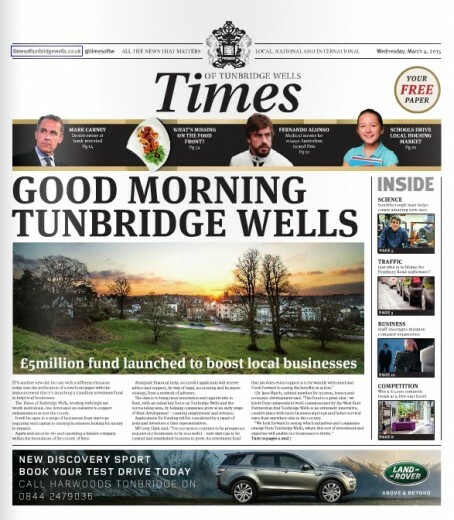 The Times of Tunbridge Wells published its inaugural issue as 30,000 copies were made available from more than 150 outlets across the town, as well as being handed out by teams of hawkers. An online edition of the freesheet has also launched, with the first front page carrying news that the Times has launched a ‘Dragons’ Den’ style £5m fund to boost local businesses. Page two of the 72-page paper featured a comment piece from editorial director Richard Moore entitled ‘What’s the point of another local paper?’, in which he gave credit to the town’s existing Kent and Sussex Courier title. He wrote: “We truly believe that there’s a place in Tunbridge Wells for an alternative voice, a quality weekly newspaper that comes free with relevant local news and features. One that is different. “That’s not to say we don’t think the existing newspaper in the town, the Kent and Sussex Courier, is not doing a good job. “It certainly is and we admire and respect the role it plays. Richard added he believed the Times’s editorial policy of carrying national and international news would make it different. Speaking after the release, Richard added: “We have identified a niche in the market and believe the new title will be well received. According to last week’s ABC figures, the Local World-owned Kent and Sussex Courier currently sells 20,754 copies weekly. Lucky Tunbridge Wells. two papers based there. Lewes, not far away and capital of East Sussex, has no newspaper based there. But then I think it is owned by Johnston Press? Just for record Simon De M.
Lewes is still served by local paper, but few remaining staff based near Burgess Hill, about ten miles away, since closure of Sussex Express Lewes office. Yes, it is a JP paper. Generous tribute to the Courier. I suspect the feeling won’t be mutual! Hell of a start with £5 million fund splash. It is hard for a paid for to compete with a good quality free paper, despite the kind words. Newsquest once had superb free papers, but now reduced to rags. As for JP, their frees are worth every penny. Sounds like the old football manager snaring the opposition with praise. How many new jobs did they say? As someone who works for a daily competition is always good – whether it is competing tabloids, broadsheets or locals. It is good for the readers and the journos. And having picked up both newspapers this week I think Tunbridge Wells is lucky. Commentator Graham Roberts obviously hasn’t picked up the Kent and Sussex Courier as had the story about the care home closures, update on the Vic Hall and a front story of people slagging off the council for the state of its football pitches are all in it. The online edition looks good. It’s nicely designed and it has an interesting mix of content. Best wishes for a bright future. Good points House Style but story about football pitches sounds too low on human interest scale for front page.